“Dad,” she pleads, “I want to be a witch for Halloween.” So, you excitedly DIY a hat out of newspaper and dust off your old black graduation gown while she’s asleep. You’re pretty proud of yourself. ”No! Yuck,” she explains in the morning. See, she's a witch, but that doesn't mean she's ready to go to her cauldron party in any old thing. You see, she's a glamour witch. Honestly, Dad, sometimes you really are so old fashioned. Satisfy her dueling needs for spookiness and style by getting her this Child Glamour Witch costume. Let her show off her fashionable ways and her fearsome nature all at once. Trust us, once she slips it on, she's sure to feel like the top spell caster in her group, and for that, she’ll likely forgive you for the whole graduation robe thing. Probably. That’s because the classic witch theme of this ensemble is enlivened by pretty purple accents, so she can be ready for all kinds of double, double toil and trouble..., but in style. The pointy black hat even has a little bling, as does the sparkly belt buckle. And who needs a broomstick when you can ride a hover board? You may not get her unique look, but that’s OK. It’s not your job. Just love her as she is, quirky costume and all, and promise to never, never try to make clothing from newspaper for her again. 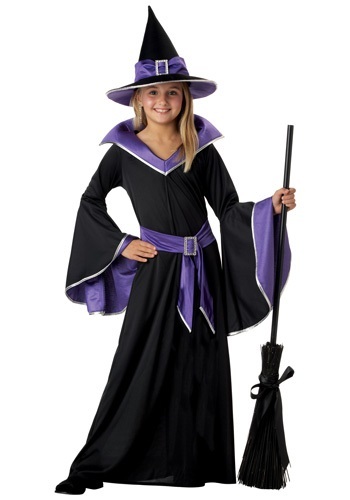 I loved this witch costume for my daughter and i like the fact that it wasn't as wicked even though it was a witch. She had fun and was very happy. The costume arrived in a timely manner and price was not to much. Gorgeous costume. Arrived super fast!